Thanksgiving is quickly approaching, and so is the last day for pre-orders! Sunday (Nov. 18th) will be the last day we’ll be accepting any online orders for Thanksgiving day. If you use our coupon code NOV18 by November 18th, you can receive 15% OFF your online order. How sweet! 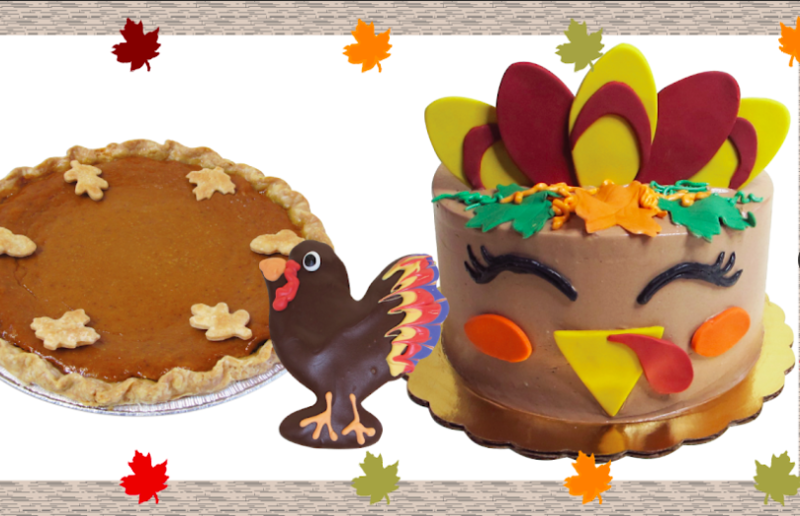 We have plenty of options for your Thanksgiving desserts, from pies to cupcakes to cakes, we have it all. The pies we are offering are Pecan Pie, Pumpkin Pie, and Apple Pie. The cakes we have are a Turkey Cake with fondant feathers and fondant face features, and a Fall Leaves Cake with a fall leaf edible image border and fondant leaf accents on top. The Thanksgiving-inspired cupcakes we have are our Pumpkin Chai Cupcake and Turkey Cupcake, which has an adorable turkey pick and leaf-shaped sprinkles. Other options we have are our Turkey Shaped Cookie and Mini Pumpkin Cheesecakes, which you can never go wrong with. To view pictures of these treats, click here for our flyer. We’ll be open on Wednesday (Nov. 21) & Friday (Nov. 23) from 8 am- 6 pm, but CLOSED on Thanksgiving.